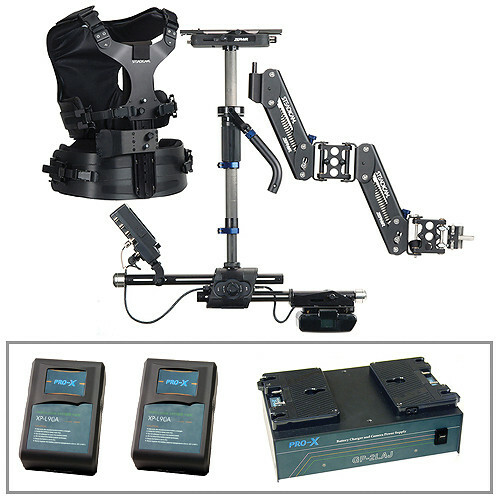 The Steadicam Zephyr Camera Stabilizer, HD Monitor, Vest, Batteries/Charger Kit from B&H Photo is a camera stabilizer system that supports camera payloads up to 24 lb (11kg). It includes 2 Switronix XP-L90A lithium ion brick batteries and a Switronix GP-2LAJ 2-Position Simultaneous Charger, so you can get up and running right away. You are offered enhanced inertial control, and allowed to make dynamic adjustments to the base of the stabilizer system. Included with the Zephyr is the Compact Vest that integrates an ergonomic design with solid metal shoulder fasteners. A stiff front spar and yoke combined with a vertically adjustable socket block allows you to use the Zephyr for extended lens heights, especially in low-mode. Easy cleaning of removable vest and pad covers is also possible. A camera weight of 5–24 lb (2.2–11 kg) can be supported via the Iso-elastic arm that can be adjusted without any tools. Integrating a 2-stage arm design, the Iso-elastic arm can be separated for storage and transport. Also included is a carbon fiber centerpost. Augmented stability during camera mounting is provided via the dovetail stage base. You are also provided with a standard composite BNC input connector and a RCA output connector. Anton Bauer battery mounts are provided with the Zephyr system. Easy adjustments are possible to the rigid aluminum battery or monitor rod rendering it suitable for storage and transport. A single knob rod-release feature is also incorporated for quick setup. Included with the Zephyr system is the HD 7” LCD Monitor providing enhanced image quality and a wider viewing angle via aspect ratios of 4:3/16:9, and brightness of 500 cd/m2. Inertial control is offered via standard Steadicam Merlin type balance weights, and balance control is provided via a standard 1/4-20 mounting hole at the sled base and additional balance weights. You are also offered a gimbal that incorporates a knurled ergonomically designed grip. The XY Vernier stage of the Zephyr stabilizer system is constructed from aluminum and provides rigidity while a dovetail plate design is integrated into the stage. Also included is a soft case for system storage.